How Will I Know If I Like Living in Delaware? Thinking of relocating to Delaware, but have questions? That is a good question, especially if you are considering moving to Delaware or any area that you really do not know. So, what do I recommend? Plan to take some time to visit the locations that you are possibly interested in for retirement. A good time to start is 2 to 3 years before your planned move. Visit each of the possible locations during the peak season and the offseason. Before you go, make contact with a local REALTOR, and schedule a meeting to go over your plans and thoughts about your retirement. Do this early in your visit so that your REALTOR can show you communities that offer the amenities and type of home you’re interested in. You will then have time to go back several times to communities that made the cut BEFORE YOU RETIRE! On the other hand, if you have hit that magic date and are now retired, or worse yet, your home has sold but you still don’t know where you want to go – DON’T PANIC!! Relax and give us a call. We deal with people in this situation all the time, and we can help you find a solution. We have an excellent team of agents, most of whom moved here from somewhere else. Not only can it be difficult to find rentals with flexible terms, it is almost impossible to find rentals in the exact community or type of community in which you may want to purchase. So, if the rationale is to try living in a particular community to see how you like it, that may never happen. During the vacation season, most home rentals are weekly or monthly at high season rates. If you rent during the offseason, you will then need to be moved out by spring or pay high vacation rental prices. 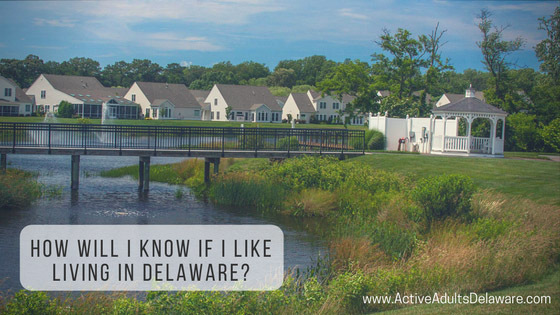 A better idea is to work with an experienced REALTOR from Active Adults Realty who can truly help you decide if there is a community for you here in Delaware. Our real estate agents work for you and they know the questions you haven’t even thought to ask yet, plus they know most of the answers. If at the end of several visits to Delaware touring communities and getting to know the area, you are still uncertain, then you should not move. If you are considering relocating and living in Delaware, we can help you. Give us a call at 302-424-1890 or email Broker@ActiveAdultsRealty.com.